In the following descriptions, "heel" means straightened leg extended to the side, heel to the ground, toe raised. "Toe" means toe to the floor, close to the supporting foot, knee slightly bent. Start with the first part of the Bohemian Polka: Heel-toe along LOD (1-2), turning polka (3-and-4), repeat opposite. Continue with the Esmeralda (slide-and-slide-and-slide-and-turn, slide-and-turn, slide-and-turn). Then repeat the whole sequence opposite. 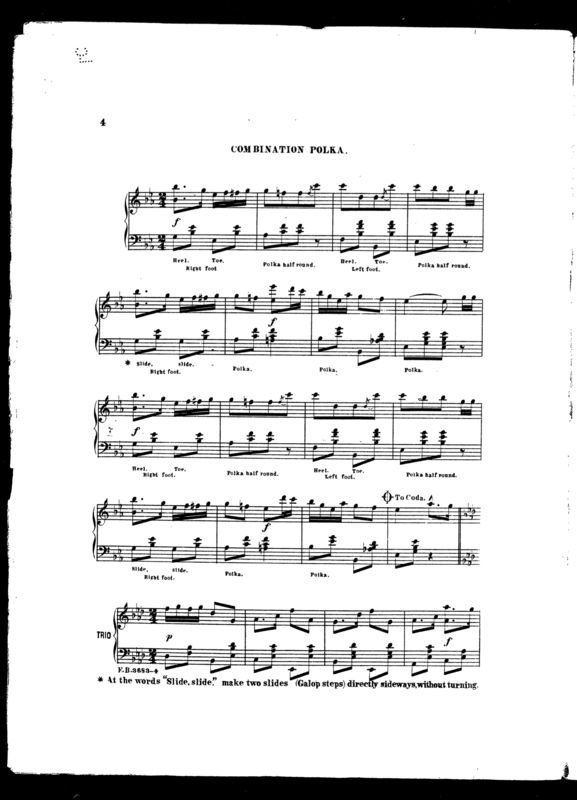 Newman 1903 describes an alternate version with 16 bars: heel-toe, polka x 3, repeat opposite, then a full Esmeralda. Repeat as before (not opposite). *At the words "Slide, slide," make two slides (Galop steps) directly sideways, without turning. First Part:—The same as the first part of Heel and Toe Polka; four measures. 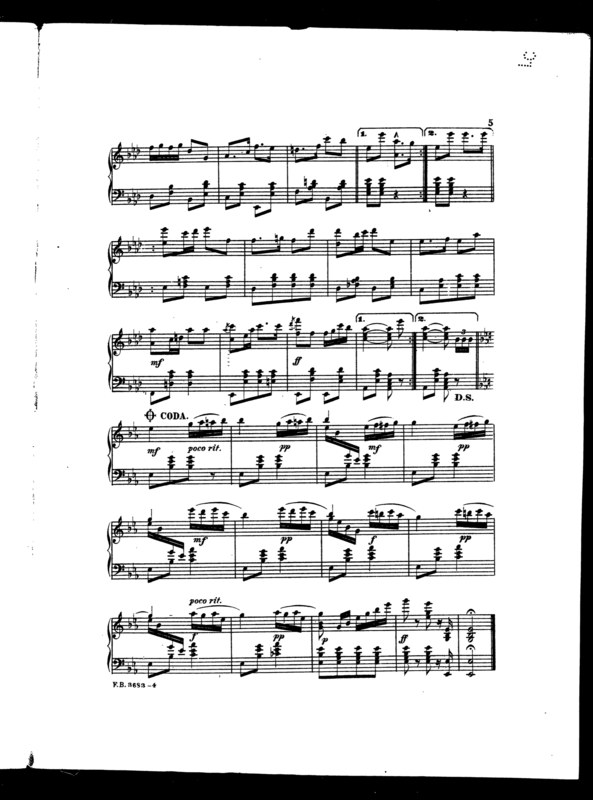 Second Part:—The Glide Polka, two measures. Third Part:—Polka, two measures. In all, eight measures. Recommence at first part. The lady hops slightly on the left foot, and at the same time extends the right to second position with the heel touching the floor and toes raised (1); then hops again, bringing the right foot to fifth position behind the left, toes touching the floor (2). This occupies one measure of the music, and is followed by one measure of the plain polka, after which the heel-and-toe is repeated with the left foot. The steps for the gentleman are the same, substituting left for right, and vice versa. The Heel-and-Toe an the plain polka are thus alternated throughout the dance, or four measures of these two movements combined may be alternated with four measures of the Esmeralda. Left heel to 2d Pos. (1), 1/2 B. Toes of L.F. to 5th Pos., with heel raised (2), 1/2 B. Then three polka steps; turning, starting with L.F., 1 B. Repeat all with R.F., 2 B's. Then finish with the Esmeralda (two slides and three polka steps left and the same right, 4 B's.